Given the nature of my involvement in cases, I’m not often present in the courtroom when the jury receives its instructions. But I remember one time that I was. As the judge read out the sections focusing specifically on the credibility of witnesses, I thought, “This is deeply misleading…if not outright wrong.” The advice to the jurors just prior to their deliberations was to consider the completeness of a witness’s recall, with no additional information on the limits and distortions of memory, and to assess truthfulness based on their own careful observations of the witness’s demeanor while testifying. The suggestion was that you can treat a confident recollection as unproblematic and you can tell who is and who isn’t telling the truth by looking at them carefully. As I heard this, I couldn’t help but think about how this advice fails to square up with the bulk of the research on assessed truthfulness. But since courtroom procedures don’t allow a social scientist in the gallery to stand up and say, “I object!” during the instructions, I had to sit quietly and rely on the likelihood that jurors would default to more holistic and less appearance-driven cues to credibility. It is likely that they will do so. 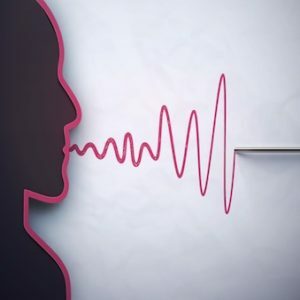 After all, the task of assessing the credibility of those we communicate with is not just reserved for jury duty, it is something we practice throughout the day. In these other contexts, demeanor does matter, but it is also perceived in the context of a broader narrative backdrop. But one question is whether we could do a better job of communicating the assessment of credibility to jurors. One person answering an emphatic “Yes” to that question is U.S. District Judge Michael Bennett of the Northern District of Iowa, in an essay appearing in Duke Law School’s Judicature publication, a streamlined version of a longer law review article he wrote in 2015. Noting that cases often turn on the credibility and demeanor of witnesses in both civil and criminal cases, Judge Bennett argues that current instructions are woefully out of date, with most judges using instructions on witness credibility that have remained more or less the same for the past century. The solution, he says, is to rewrite the instructions so they make sense in light of a more modern and scientifically-based understanding of assessed credibility. Judge Bennett argues that there are three areas where witness credibility instructions are out of sync with social science. Court process tends to treat memory as a kind of recording, and to consider it in the absolute sense of whether it is there or not. Judge Bennett, however, uses the good analogy that memories are less like a video camera and more like a Wikipedia page, with numerous sources and the potential for constant revision. There is a strong psychological pull for treating confidence as a proxy for accuracy, and the trial process can end up reinforcing that association. Unfortunately, they seem to be two distinct traits: There is no clear and reliable correlation between witness confidence and witness accuracy. Judge Bennett proposes a “Model Plain English Witness Credibility Jury Instruction,” which he has used in all of his civil and criminal jury trials for the past four years, without objection. These instructions have the advantages of being easy to understand and less likely to mislead on the subjects of memory, demeanor, and confidence. As with all factors in trial, there is a strategic consideration: If yours is the side that has the stronger, more confident and more effectively-delivered testimony, of course it is possible that these instructions could of course undercut that advantage. 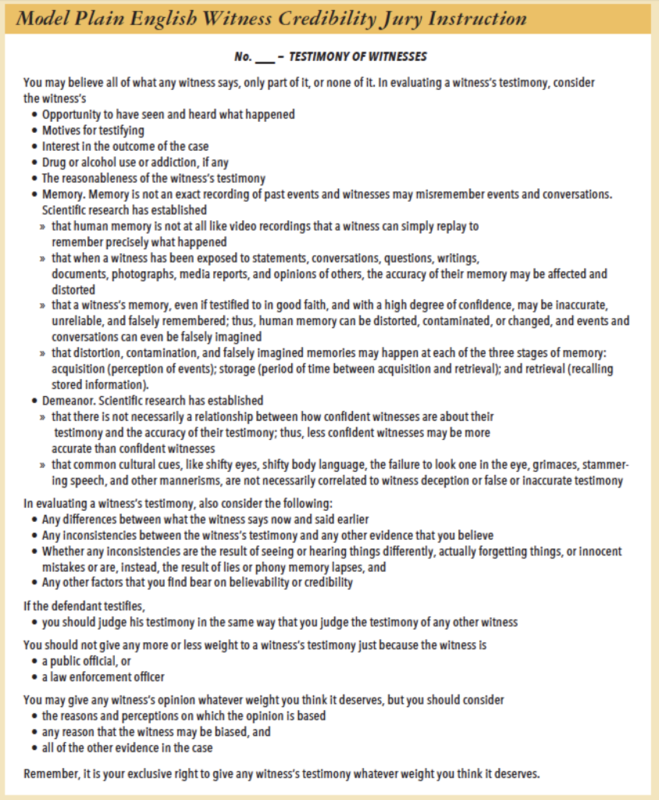 The message for judges and for those parties who want jurors to apply a more psychologically-grounded view of credibility is to adopt or request a version of Judge Bennett’s instructions. In fairly clear terms, these instructions warn jurors away from a reliance on popular but unsupported assumptions as the keys to discerning truth. The last one in particular corresponds to what is perhaps the most human way of developing meaning and reaching conclusions: through stories. We understand new information in a holistic way, looking at both the ways it hangs together (narrative coherence) as well as the ways it resonates with the conclusions we have already reached (narrative fidelity). And there are likely additional ways of explaining the reasonable ways of assessing credibility. Future instructions and research should look at the effectiveness of these tools as an alternative to some of the more dated assumptions about the human ability to discern the true from the false.